Streets are flooded early Sunday in Houston. Harvey was expected to remain at tropical storm strength through Wednesday, the National Hurricane Center said. The White House says President Trump will visit Texas on Tuesday. It's unclear exactly where he will visit, however. There are 65 counties under the state's disaster declaration. Gov. Greg Abbott held a press conference in Austin this afternoon and added 12 counties to the 49 already on the declaration; he added another four counties later in the day. Abbott says 3,000 National and Texas State Guard troops have been activated to assist in relief efforts. He says the state is providing everything the Houston area has asked for and is standing by to do more. Houston 911 operators have received thousands of calls for rescue amid flooding from Tropical Storm Harvey, Mayor Sylvester Turner said at a news conference Sunday morning. He said the city is augmenting its resources with the help of state and federal agencies and opening additional shelters. He urged people to stay in their homes, calling it the "safest place to be." "If you're getting water, but it's not life-threatening, simply stay put," he said. "Do not get on the roads." Houston Police Chief Art Acevedo reiterated that people need to stay indoors, saying every person who goes out who doesn't need to go out "presents a new challenge. … [Emergency personnel] need to focus on people who are in need. Help us out." When asked why the city hadn't ordered an evacuation before the storm, Turner said, "You simply cannot put 2.3 million people on the road. If you give an order to evacuate, you are creating a nightmare, especially when it's not planned." "This is a storm that is testing the city of Houston," Turner said. "The city will rise to the occasion." The officials did not confirm reports that four additional people in Houston had died due to the storm. Two deaths have been confirmed - one in Harris County and another in Rockport. Emergency officials were advising Houston residents to get on their roofs if necessary to escape "catastrophic flooding," as rain battered the city. Acevado warned people not to get in their attics to escape floodwater "unless you have an ax or means to break through onto your roof." 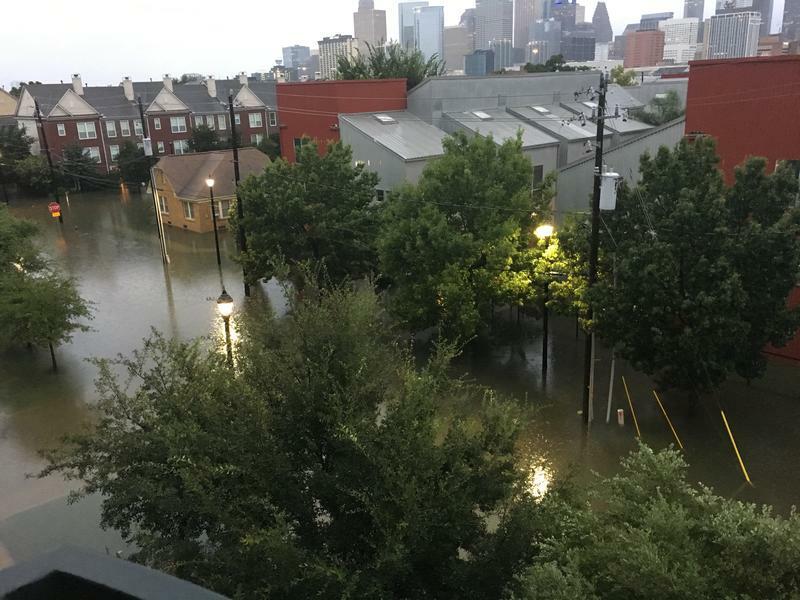 To prevent downtown flooding, the U.S. Army Corps of Engineers said it plans to release water Monday from two flood-control dams into the already-swolen Buffalo Bayou, the Houston Chronicle reported. Homeowners near the reservoirs will likely experience some flooding, the paper said, and officials will issue a voluntary evacuation for residents near the bayou. Water rescues were underway and shelters were full. The city tweeted that 911 services were at capacity and asked residents to call only if they were in "imminent danger." NPR's Jeff Brady reports that two hours after the city opened two shelters last night, it had to close one because of high water. The U.S. Coast Guard said it is conducting a search-and-rescue operation in the Houston area and has received more than 300 requests for aid. Some parts of the city saw up to 6 inches of rain an hour overnight, the Office of Emergency Management said. Over the last 24 hours, the Houston/Galveston region has recorded 24.10 inches of rain, the National Weather Service said. "[Lindner] says he's most amazed that he's getting reports 'of water into second-story of apartments and homes.' Considering Houston's flat terrain, 'it's very rare to get that depth of water.'" A flash flood emergency was in effect for much of southeastern Texas. 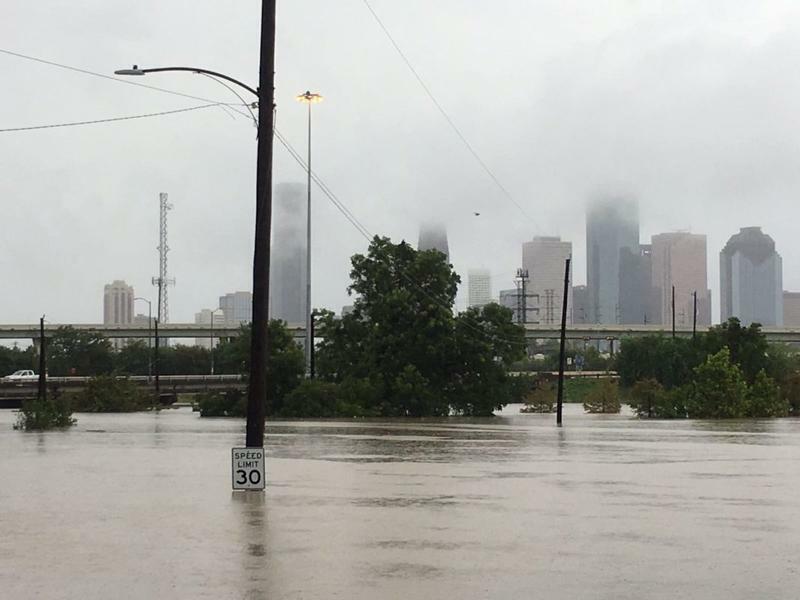 A number of roads around Houston were closed due to flooding, including major highways. Acevedo last night urged motorists to get off the roads. Please get off roadways now. This large band is causing roadways to flood and folks are being stranded in it. Don't try to outwit nature. At least two people died as a result of Harvey, which was downgraded to a tropical storm after coming ashore as a Category 4 hurricane on Friday night. At least one person died in flooding in Harris County. Another person was killed in the city of Rockport, about 30 miles northeast of Corpus Christi, where the storm made landfall Friday. Harvey was producing torrential rainfall as it slowly churned across southeastern Texas. The storm, with maximum sustained winds of 45 mph at 6 a.m., was forecast to continue to "meander" through the middle of the week, AccuWeather Meteorologist Evan Duffey said. Bastrop Judge Paul Pape placed Bastrop County under a declaration of disaster Saturday evening. Mandatory evacuations were announced for 548 and 545 SH 95 (North of Bastrop). A flash flood watch was in effect through Wednesday evening for Travis, Williamson, Atascosa, Bastrop, Bexar, Blanco, Caldwell, Comal, De Witt, Fayette, Gonzales, Guadalupe, Hays, Karnes, Kendall, Lavaca, Lee and Wilson counties. 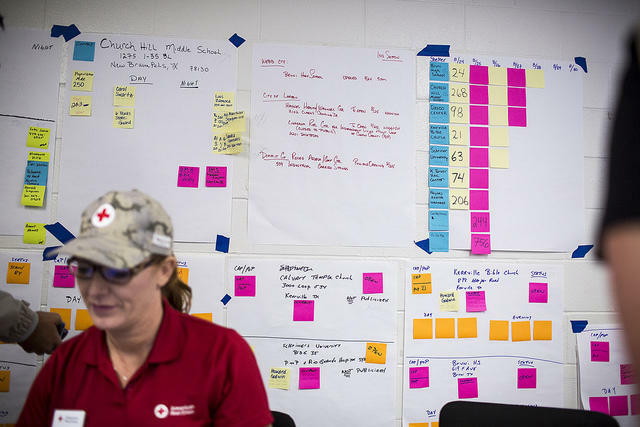 As the storm lingers, state officials are urging Texans to expect persistent rains and underscoring the potential for life-threatening floods. ERCOT reported more than 300,000 customers without power along the coast, where cleanup efforts are just beginning. President Donald Trump tweeted that he would visit the region at some point. Trump signed a disaster declaration before the storm came to shore Friday, allowing federal resources to be directed to areas affected by Harvey. One person is dead in Rockport in the aftermath of Tropical Storm Harvey, according Aransas County officials. Another person is confirmed dead in Houston, as unprecedented rainfall brings flooding across Southeast Texas. As it continues to linger, state officials are urging Texans to expect persistent rains and underscoring the potential for life-threatening floods for the next few days across the state. Hundreds of thousands are without power along the coast, where cleanup efforts are just beginning.